After Moldova, Transnistria and Ukraine (I haven’t reported on my starting point, the Bucovina district of Romania yet) my final Eastern European stop was in Belarus – ‘Europe’s last dictatorship,’ thanks to Aleksandr Grigoryevich Lukashenko who has been President for Life since 1994. ▲ Well surprise surprise, I found it a really interesting country for a brief visit. Full of surprises starting with this apartment block just across the Svislach River from my hotel. 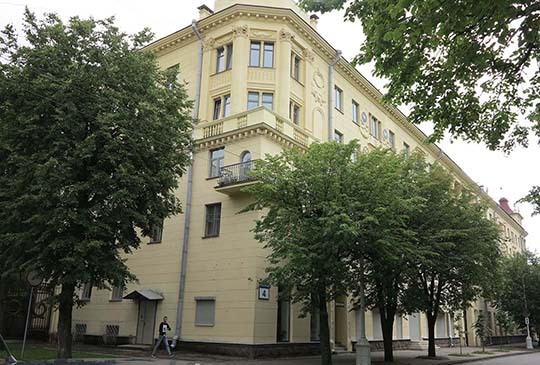 Yes it’s the apartment block where Lee Harvey Oswald lived during his spell in the old USSR before he moved back to the USA and on 24 November 1963 shot JFK in Dallas, Texas. I’ve no idea what the apartment was like inside, but it’s certainly a very nice building externally and with a great location. The KGB were deeply suspicious of Oswald and shipped him off to Minsk, well away from the centres of Soviet power. ◄ The Island of Courage & Sorrow, in the river, is a memorial to Minsk losses during the USSR’s painful war in Afghanistan. 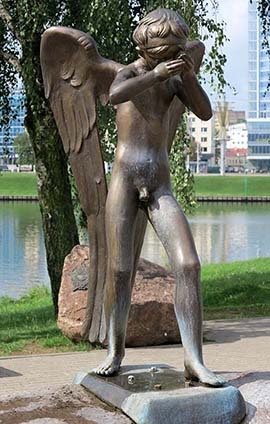 The statue of a crying angel perhaps led to its better known title as the Island of Tears. 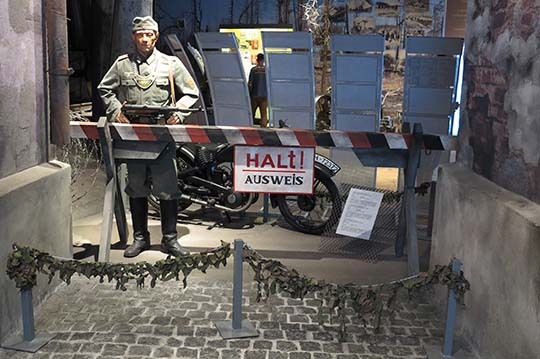 ▲ Minsk was on the German-USSR front line and was totally destroyed during WW II. 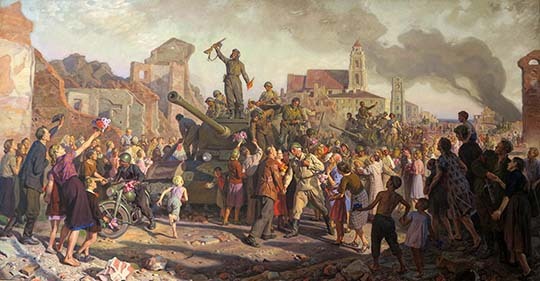 There wasn’t much left standing when Russian forces rolled back into Minsk on 3 July 1944, this painting at the Belarusian State Art Museum illustrates the liberation. ▲ There are plenty of reminders of that bitter struggle at the ‘garish,’ Lonely Planet’s description, Museum of the Great Patriotic War. ◄ The WW II destruction left the USSR with a clean slate to totally rebuild the city in Stalinist fashion in the 1950s. 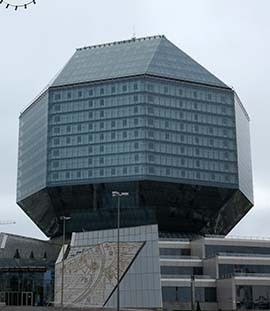 This is the Lukashenko-inspired National Library of Belarus at one end of the city’s main drag pr Nezalezhnastsi (Independence Ave), at the other end is the grim KGB Headquarters. You can inspect the whole avenue from double-decker City Tours run from the train station. 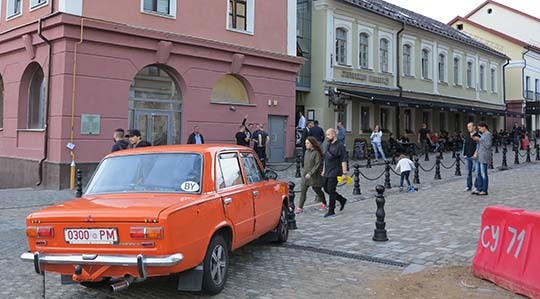 ▲ There are plenty of other reminders of the Soviet period, none better than a bright orange Soviet-era Lada car. ◄ The Old Town (Upper City) was the centre for the city’s thriving Jewish population, pre-WW II. 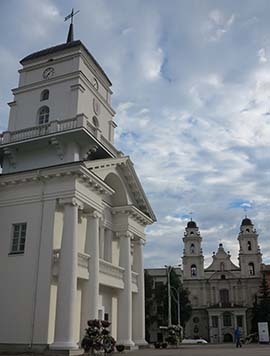 They were wiped out and most of the Old Town architecture was destroyed in the war but there have been some sympathetic rebuilds, like the Town Hall and the Cathedral of St Virgin Mary. 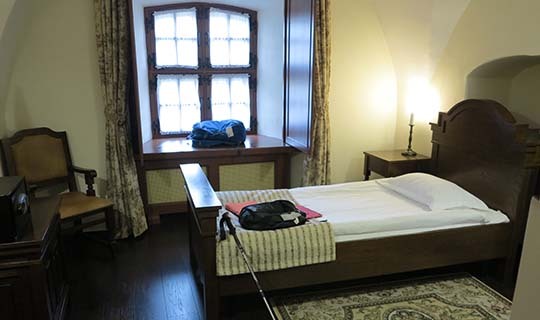 ▲ My room in the Hotel Manastyrski in the Old Town had a decidedly monastic look to it. Comfortable though. 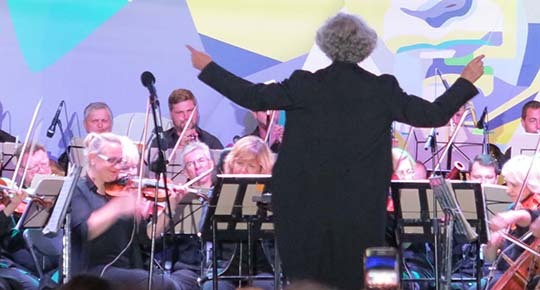 ▲ Coming back to my room on my last night I came across this concert – with a very energetic conductor and lots of onlookers – in Svabody Square in the Old Town. 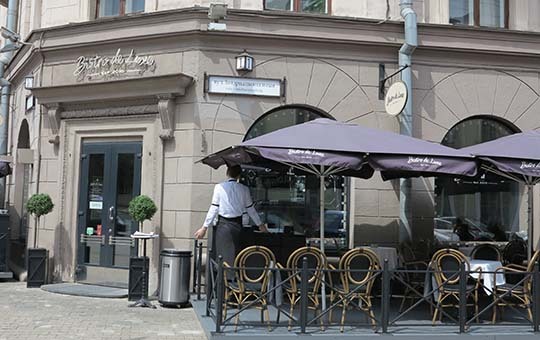 • Housed in a gorgeous space with chandeliers, sleek brasserie-style furnishing, chessboard floor and luxury toilets, Bistro de Luxe has charm and atmosphere that’s hard to find elsewhere in Minsk. The food is excellent – it leans towards Italian – and service is impeccable. Every word was true and I’d add friendly and great value as well. Really the most enjoyable restaurant I’ve eaten at for some time. 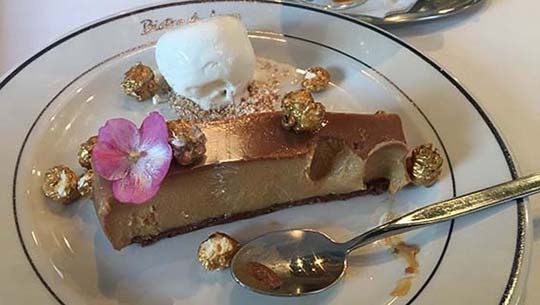 ▲ My dessert – salted caramel with ice cream (no, not salted caramel ice cream, ‘with’ ice cream) – looked so good I felt obliged to photograph it.